There have been so many fun opportunities for us to expand our skills and learn new techniques for everything from growing to designing lately, and we love it! Earlier this month, one of Trisha's good friends and a fellow Lancaster County floral designer, Kate of Forte Florals, came to the barn to give us a mini training session on some tips she had just learned at a Floret Flowers workshop. It was such a refreshing morning doing what we all love most, playing with flowers! The style Kate was showing us has a more free flowing, natural, and loose look that we are all starting to fall in love with. She walked us through several basic steps for creating a beautiful bridal bouquet composed of so many varieties of greens and blooms all complimenting each other perfectly. 1. Establish your shape by making an X with two stems of greens. 2. Build your foundation using a variety of greens. 3. Add airy elements, keeping your grip loose and turning your bouquet in all directions. 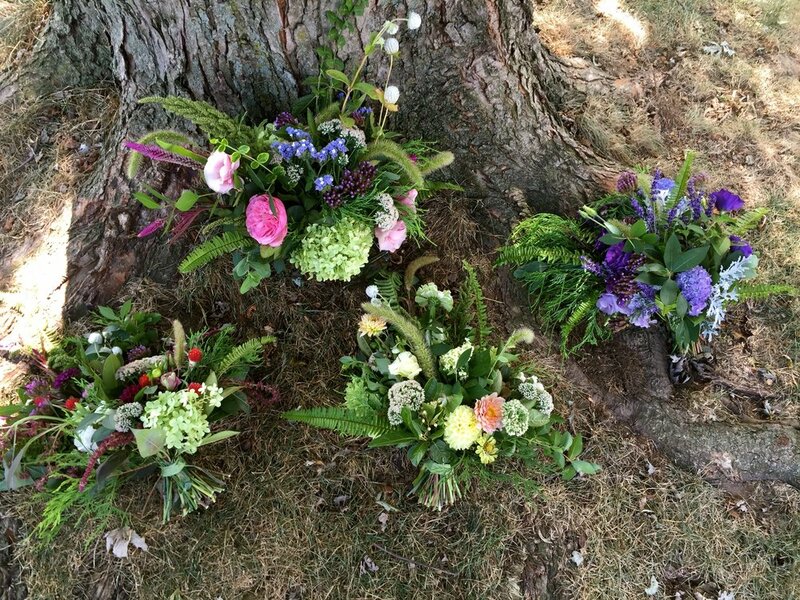 Consider standing in front of a mirror to be able to see the bunch from the back or having a friend hold your bouquet while you continue to add greens. 4. Thread in color. 5. Finish with delicate accents, letting each unique flower and green take it's place. 6. Tie and fluff. Consider using a long ribbon with two colors that accent the bouquet appropriately. Prepare all of your greens and flowers before you start creating by stripping each stem ahead of time. This way you can hold the bouquet with one hand and weave in new stems with your free hand without having to worry about picking leaves off. While creating, don't be afraid to hold the bouquet loosely and let things fall out as you go, the bouquet will take a more natural shape if you aren't gripping too tightly.